I've been itching to sew lately, but with my travel schedule the way it has been, that hasn't been easy. 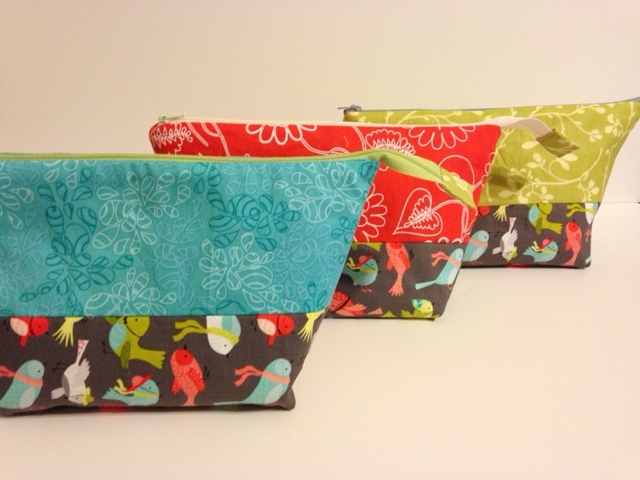 In order to finally have a finish behind my belt, I decided to make a few wide open pouches (the medium size). I feel like I'm past the wedding stage of my live and have moved onto the baby stage where instead of going to weddings every month, I'm going to baby showers instead. So having a few of these on hand for gifts will be good, especially since I won't have the time to make quilts for all of them even though I'd like to. I love making these pouches because it's a great way to dig into my stash and use up some of those novelty prints or fabrics I'm not quite sure what to do with anymore. Sometimes they just make the perfect pouch or bag. Now to dig into a quilt or two!